Carson City, NEV – George Gessler and Ceil Perrin have received permit from the county to construct a 350-car drive-in on Highway 395 north of town. Construction is expected to start immediately and opening is set tentatively for May 1. Gessler operates Hunter’s Lodge here and previously has operated theaters in Oregon. He will be active manager of the drive-in. Perrin operates the Pine Cone cafe here. The Sky-Vue Drive-In theater was located on the land where the now-closed Northgate Movies is. Right where Hot Springs Road splits off from Carson Street. 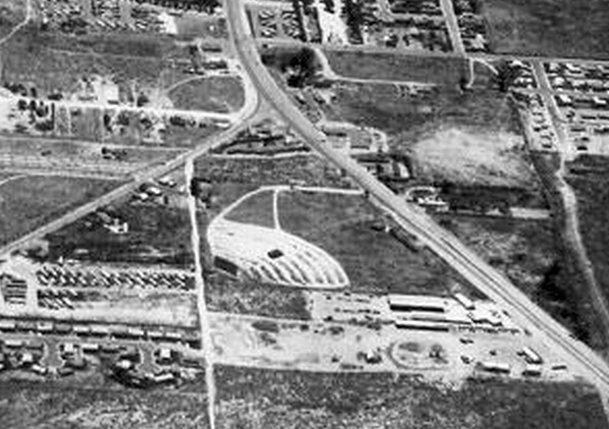 I don’t have any photos of the drive-in, except this aerial shot from far away. I do have both the Hunter’s Lodge and Pine Cone Cafe too. Also in the Nevada Appeal, June 1953. Hunters Lodge was sold by George Gessler to Jerry Taksley of Denver. The sale included the building owned by Ken Johnson. Gessler, who opens his restaurant and bar April 1, 1952, plans to devote full time to Sky-Vue Drive-In theater of which he and Cecil Perrin are owners. Johnson has owned the lodge many years, including the original two-story building which burned down a few years ago.